Compact Touch STS UBMTM delivers high resolution digital imaging. 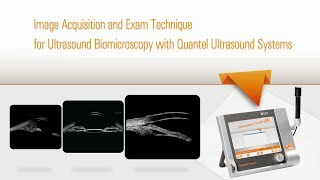 Quantel Medical’s proprietary linear scanning and automotive technology allows for maximized perpendicular to tissues, throughout the examining field. Quantel Medical’s Compact Touch STS UBMTM is the diagnostic tool able for both glaucoma, post treatment evaluation and refractive surgery. Work faster and smarter with this easy-to-transport ultrasound platform. Compact Touch STS UBMTM also offers an intuitive user interface accessible through a touch screen panel. The Compact Touch STS UBMTM is the diagnostic tool able to qualify and quantify the angle closure in glaucoma patients. 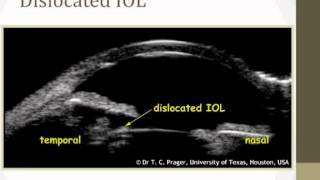 It provides excellent viewing of the structures located behind the iris leading to a better understanding of the various causes of angle closure such as pupil block, iris plateau, tumors and cysts. UBM examination assists the physician to make a more informed treatment plan. Compact Touch STS UBM™ is also used for surgical prognostic in case of filtration surgery. For anterior chamber IOLs, Compact Touch STS UBM™ allows the viewing of the entire anterior chamber in one single scan. The anatomy of the anterior chamber can be easily checked and the angle to angle measurement easily performed. Consider the Compact Touch STS UBM™ for sulcus to sulcus measurements prior to phakic IOL implantation. The Compact Touch STS UBM™’s user friendly software offers quick access to all functions thanks to easily identifiable icons. Still images and video sequences can easily be reviewed in order to select the best scan. The software includes an eye diagram allowing the user to document the probe orientation and accurately label echograms. The structures adjacent to the probe are continuously displayed on the right hand side of the screen. No more limitation of use related to sterility, comfort and safety, Compact Touch STS UBM™’s lightweight probe is compatible with the Clearscan ® cover. The patient can be examined in a seated position. ©2019. 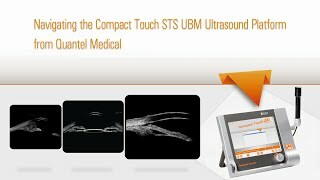 Quantel Medical, Compact Touch STS UBM™ is a registered trademark of Quantel Medical. All rights reserved.